The U.S. Congress has approved a US $750 million program of funding for countries in Central America in a bid to curb the wave of undocumented migrants and unaccompanied children crossing the border. 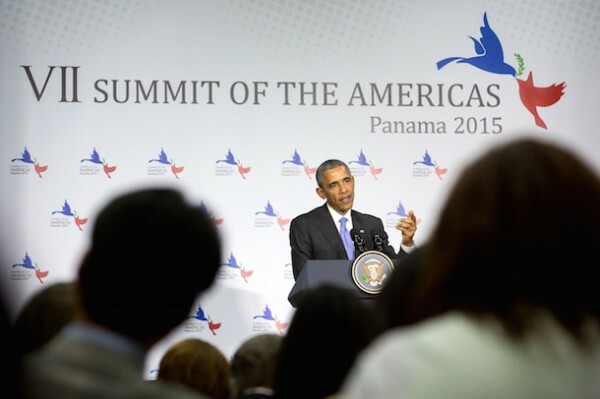 President Obama speaks during a press conference at the Summit of the Americas. The Alliance for Prosperity Plan for Guatemala, Honduras and El Salvador has been in the pipeline since early 2015, and will nearly triple the current U.S. funding level in Central America, with the stated goals of beefing up security, strengthening institutions, and reducing poverty. But opponents to the program argue that the plan is focused on making the region more attractive for direct foreign investment. Main said that not only would the plan not improve the migration situation, it would aggravate it. Migration from Central America to the United States has spiked in recent years. El Salvador, Honduras, and Guatemala have three of the five highest homicide rates in the world and some of the highest femicide rates in the region. In Guatemala and Honduras, massive corruption scandals have shattered any popular confidence in the countries’ governments, spurring growing popular movements that have driven Guatemalan president Otto Perez Molina from office and called for the immediate resignation of Honduran President Juan Orlando Hernandez. The $750 million in funds for the Alliance for Prosperity plan come out of the 2016 US $1.1 spending bill passed by the U.S. congress on Friday and is the largest aid allocation in the 2016 budget. Short of the US $1 billion originally requested for the plan by President Barack Obama, the approved figure is higher than what many proponents of the initiative expected. Debate over the plan has centered around whether the program will focus on education and alleviation of poverty, or on pumping up military muscle. According to a fact sheet on the White House website, of the original US$1 billion requested, US$400 would be allocated to promote local and international trade, transportation, customs and border integration, commerce and business development, education, vocational training, and poverty reduction. Commentators have noted that although the program looks to be a departure from U.S. government’s failed regional security policy, the reality is that little has changed. As the proposal was in planning stages earlier this year, lawmakers raised further concerns that they were not convinced that the leaders of the Central American countries demonstrated a strong desire to eliminate corruption. Others noted that the US$2 trillion “war on drugs” had not yielded concrete results since its formation in 1971. Human rights organizations have warned that the initiative will do nothing to resolve the root causes of migration in the region. According to the head of an international humanitarian mission Leticia Gutierrez, who works with Central American migrants in Mexico, the U.S.-funded Alliance for Prosperity initiative is “a populist, palliative response” that will not solve the “acute situation” in Central American countries. “Prosperity for whom?” asked Gutierrez, calling the plan a mockery and an insult that will aid Central American governments in consolidating their control over their people. While the people in Central American countries suffer “hunger, lack of dignified work opportunities, and insecurity,” it is the elite who enjoy prosperity, Guiterrez added.